Kaale chane ki ghugni is a traditional recipe which is made as a prasad on the eighth day of Navaratri that is Ashtami. 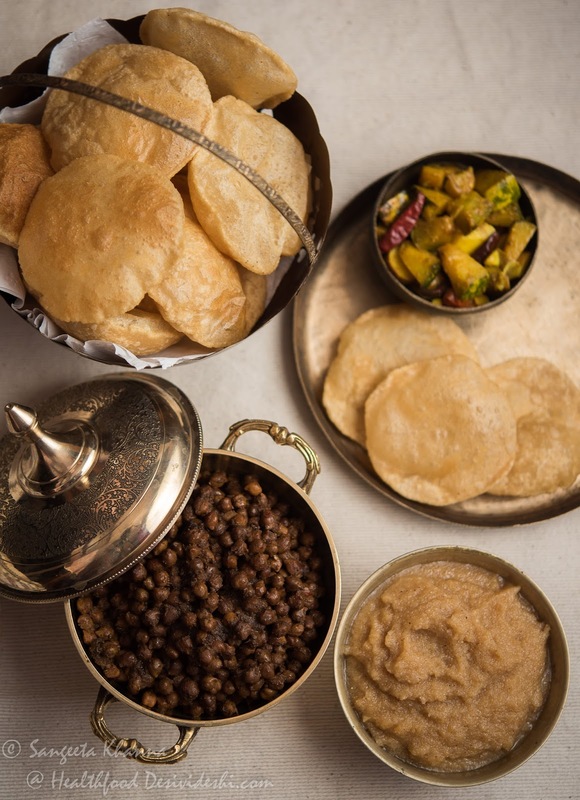 Along with this sookhe kaale chane it is poori and halwa as the usual prasad that day. Poori, chana and halwa prasad along with some fruits is served to little girls on Ashtmi day as young girls are considered Devi or goddess Durga and are called as Kanjka for this day. Some people celebrate the Kanjka on Dirga ashtmi (eighth day of Navratri) while some celebrate it on the next day which is Ram navami (ninth day of Navratri) but the prasad is the same. I have been doing this Kanjka ritual for many years and it is a very good feeling to see all those girls and their little brothers too enjoying the meal together. It becomes a small picnic for children that day. Many kids wait for this day so they can have a great time and get some gifts apart from delicious prasad. In my case there was no religious reason behind doing this, but it was always good to see little kids around Mithi. A very selfish reason I must admit. We like this dish sookhe chane even on regular days sometimes. It is a good chana recipe for lunch boxes as it is dry an tastes great even at room temperature. It is a nice tea time snack sometimes or even a small meal when chana is wrapped in a roti or paratha or even sandwiched in bread. With minor variations this sookhey chane is a staple chana recipe in many homes. 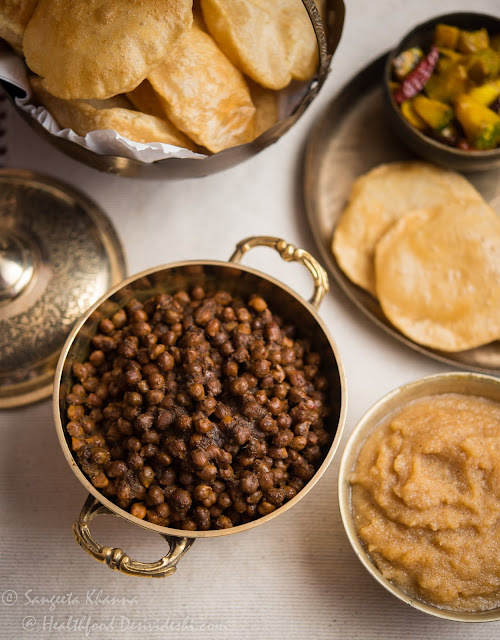 When this kala chana is made for the puja rituals it is always made in either ghee or mustard oil and there is no onion or garlic used in it. On the day of ashtmi this prasad is consider kosher, is made with extra care and hygiene. In fact in my family back home the whole kicthen used to be spring cleaned and rearranged before this day. now I don't follow those rituals and trust my everyday hygiene better. Everyone reminisces how the poori chana halwa tastes so much better on the day of Ashtmi though. The anticipation of a good meal and may be the season is right for such a meal. Traditions around food have always survived because of seasons and seasonal produce though everything in this meal is made with dry pantry staples. Drain the soaked chana and keep aside. Make a paste of ginger, chillies, coriander, cumin, peppercorns and 1 tbsp water together. Heat the oil in pressure cooker and pour the spice paste in it. Stir and cook till it becomes aromatic and looks glazed. Now add the chickpeas and toss and mix everything together. Add salt to taste. Add 1/2 cup water and close the cooker lid. Let it cook on high till the first whistle blows and then lower the flame and cook for 15 minutes. Cool the pressure cooker, open the lid and add the amchoor powder. Mix well and reduce the water if there is still some left. You can cook it in an iron kadhai as the traditional way but you will need to add more water and cooking time, the water should get absorbed once the chana gets cooked. 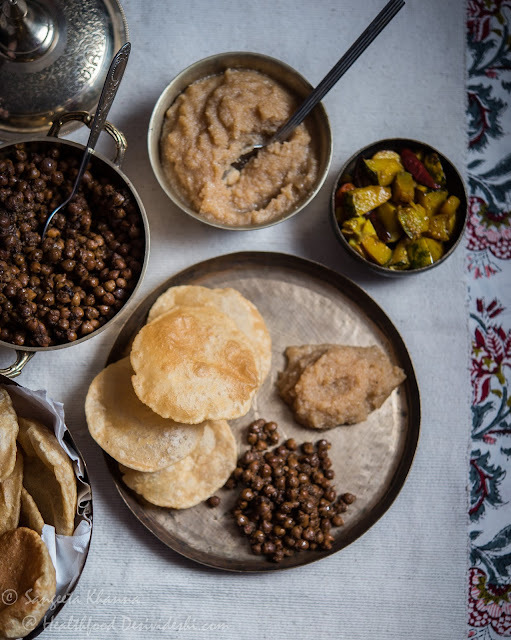 This kala chana doesn't need any garnish and tastes really great with poori. You can serve some alu ki subzi or kaddu ki subzi with this meal but it is not required I must add. These are some of the meals we crave for when we remember home and our childhood. Let's make a part of our children's childhood too and not let them crave for red velvet cakes. These puri chana halwa meals are much healthier than the burgers and red velvet cakes of the modern ilk. Thanks for visiting my blog. You have a very good collection of recipes. Liked your healthy food blog very much. Definetely should try some of your recipes. Kaale channa looks so yummy. Am making this Sangeeta; thanks! Superb ! We loved your recipe of cooking beloved chana. my family liked it more than any of the onion/tomato/ginger/garlic paste chole/chana masala we had before. Must say that picture of the halwa beside the puri and chana is what happy food memories are made of. Thankyou so much for posting this delightful article with pictures. Thanks Kamal. I am glad this recipe was loved by your family as much as we love it. Yes happy food memories are not that tough to recreate.